Liis Teene, MSc1, Kim Tapang, MD2, Ron Linden, MD2. 1MolecuLight Inc, Toronto, ON, Canada, 2Judy Dan Wound Care Centre, North York General Hospital, Toronto, ON, Canada. Presented at SAWC Spring 2016. Proceedings of the Annual Symposium on Advanced Wound Care; 2016 Apr 13-17; Atlanta, GA, USA. Clinical diagnosis of infection in chronic wounds involves assessment of signs and symptoms based on visual inspection and microbiological cultures. This process is subjective and delayed culture results often prevent prompt treatment. Fluorescence imaging has recently been introduced as a new method to visualize the presence of potentially harmful bacteria in wounds in real time. 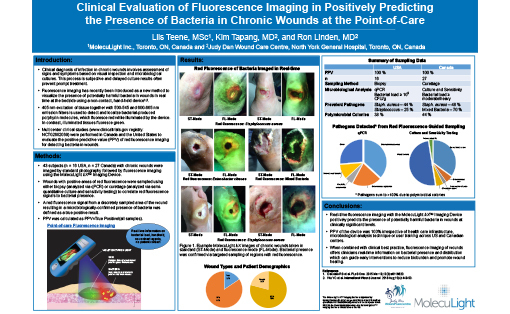 Multicenter clinical studies (Canada, USA) were performed to evaluate the positive predictive value (PPV) of fluorescence imaging for detecting bacteria in wounds. 27 subjects (n = 13 USA, n = 14 Canada) were imaged by standard photography followed by fluorescence imaging using the MolecuLight i:X device. 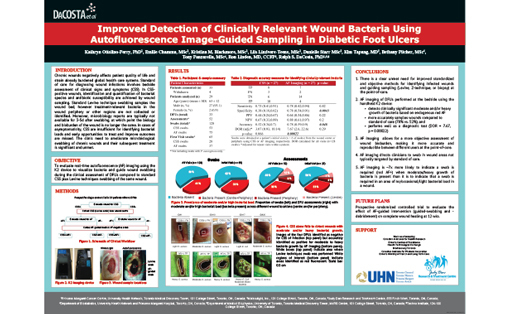 Wounds with positive areas of red fluorescence were sampled using either biopsy or curettage methods to correlate red fluorescence signals to bacterial presence. A red fluorescence signal from a discretely sampled area of the wound resulting in a microbiologically-confirmed presence of bacteria was defined as a true positive (TP) result. PPV was calculated as [TP/(all samples)]. Quantitative qPCR analysis (US sites) of wound tissue biopsies obtained from red fluorescence areas yielded a PPV of 100%. Pathogen load in these areas was > 104 CFU/g with the most prevalent pathogens being Staphylococcus aureus and Streptococcus agalactiae. Semi-quantitative results (Canadian site) from culture and sensitivity analysis of curettage scrapings also yielded a PPV of 100%. Pathogen load in red fluorescence areas showed moderate or heavy bacterial growth with Staphylococcus aureus and mixed bacteria being most prevalent. Real-time fluorescence imaging with the MolecuLight i:X Imaging Device positively predicts the presence of potentially harmful bacteria in wounds at clinically significant levels, irrespective of health care infrastructure, microbiological analysis technique or user training across US and Canadian centers. 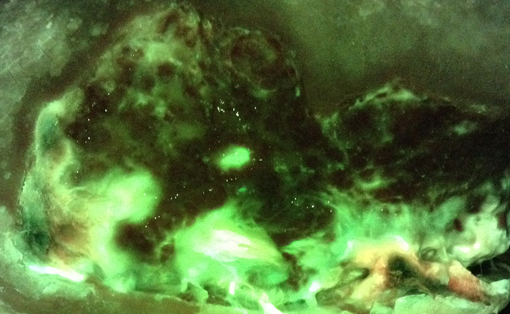 When combined with clinical best practice, fluorescence imaging of wounds offers clinicians a new guide to early treatments when bioburden levels could impede wound healing.